Jared Gardner is a professor in the Department of English specializing in American literature, comics, film and popular culture. Gardner is the author of Master Plots: Race and the Founding of an American Literature, 1787-1845; Projections: Comics and the History of 21st-century Storytelling; and The Rise and Fall of Early American Magazine Culture. Other books and writings can be found at Gardner's website. 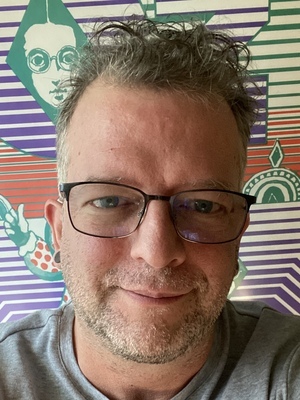 Gardner also serves as director of the Popular Culture Studies program at Ohio State and as editor of Inks: The Journal of the Comics Studies Society. Master Plots: Race and the Founding of an American Literature, 1787-1845. Baltimore: Johns Hopkins University Press, 1998. The Rise and Fall of Early American Magazine Culture. Chicago: University of Illinois Press, 2012. Projections Comics and the History of Twenty-First-Century Storytelling. Stanford: Stanford Univ. Press, 2012. The Comics of Charles Schulz: The Good Grief of Modern Life, edited with Ian Gordon. Oxford: University of Mississippi Press, 2017.